Gopalkala is a must recipe for the gokulashtami or janmashtami festival. Gopalkala is a beaten rice/ poha recipe. Gopalkala is a quick and easy recipe and you can make it anytime within 5 minutes if you have the main ingredients. Gopal kala is a special festival version of 'dahi pohe'. 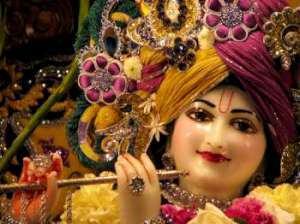 'Gopal' is the name of Lord Sri Krishna. 'Kala' means the mixture in Marathi, Indian language. Krishna grew up with the cowherds. He loved the dairy products, milk, ghee, butter, curd – yogurt etc. Krishna used to go with the cowherds to graze cows. Though a child, he was their leader. During mealtime, he used to mix everybody’s lunch together along with some curd and distribute the same to all the cowherds with him. That is ‘gopalkala’. That is the reason, gopalkala is made on the janmashtami festival day, offered to Krishna idol as naivedya and then, distributed as Prasad to the devotees. Below you will find the recipe for gopalkala. Make it for the gokulashtami festival or at any other time you want to. Most ingredients for gopalkala are available in an Indian kitchen. You will find the optional ingredients listed below the recipe. Wash thick poha using water in a bowl. Remove all water. Keep aside for 5 minutes. Heat ghee in a small pan. Add cumin seeds. When they stop spluttering, add curry leaves. Take off the stove and let cool a little till you mix the other ingredietns with poha. Add milk and other ingredients to poha and mix well. Add the cooled tempering. Mix well and gopalkala is ready to offer to Govinda – Krishna. The optional ingredients given are added to gopalkala. If you have them, add to the dish. Gopalkala tends to thicken after sometime. In that case, you may need to add some milk at the time of serving. Adding fruits solves that problem to some extent as the chopped fruits mixed with salt and sugar releases some moisture in poha. Thank you for this gopalkala recipe. I was searching for it. Now I can make it for Janmashtami festival.